May the best email win! Discover what works with AWeber. Put up to three emails to the test with AWeber. Test subject lines, preview text, message content, and even send times to see which email yields the best results. Other providers may divide your entire audience right down the middle, or limit you to testing subject lines only. 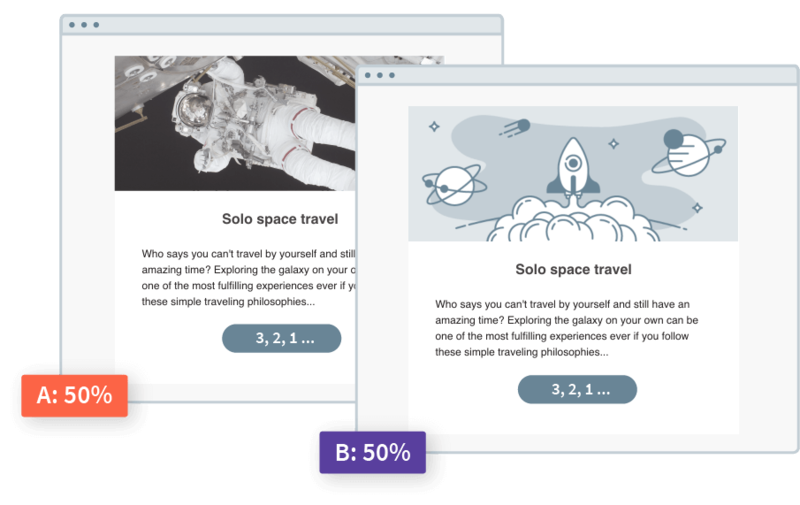 AWeber lets you test completely different emails and choose your segments and segment percentages. Run a split test against 40% of your subscribers, and deliver the winning variation to the remaining 60%. Discover what works and see the results immediately. Not sure when to send? Test sending your emails at different times throughout the day to see what gets the most engagement. Need help? Our 24/7 customer solutions team is always on– just like your email strategy. Want to know which email is getting the most opens, clicks, engagement, and sales? View your live test results.